If after E3 2016, you had told me that I’d have other games in my Game of the Year list besides Persona 5, I’d have thought you nuts. I’ve waited for this title for years now, and it’s almost hard to believe it’s been a decade since Persona 3 came out, which shook this franchise up something fierce from its PS1 days. And now, nearly a half decade since the PS Vita port of Persona 4, we’ve finally gotten our hands on the next chapter of the Persona series. After a little over a hundred hours with the latest Scooby-Doo gang, I think it’s safe to say that this one of the best games in Atlus’ history, and a worthy release for the 20th anniversary of the Persona series, even if it isn’t perfect. 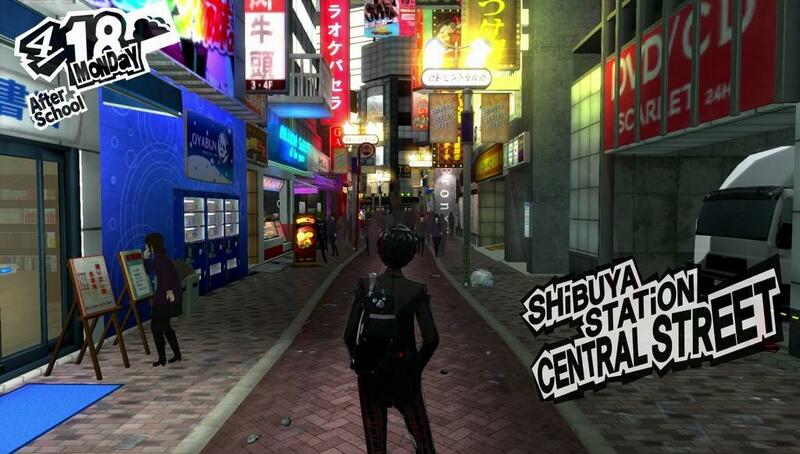 Persona 5’s story follows a similar structure and formula established by the past few games. There’s a near-silent protagonist who’s going through high school, while working against the machinations of unseen forces following a game’s key theme. For those not in the know, the key theme is rebellion. Rebellion against those who use their ill-gotten gains to further their own power in the world. Rebellion against a corrupt system that has put me (in my protagonist shoes) in an unfair position. What started out as an act of a good samaritan, responding to the cries for help from a woman in need, quickly turned the tables and now I’ve been shipped off from my hometown to the bustling city of Shibuya, Japan. It’s here that my new school year began, along with my fight to take back the future that was stolen from me, thanks to the criminal rap sheet I now bear. From start to finish the odds are impossibly stacked against me, and just like in previous Persona games, it’s the strength of my bonds that will ultimately see me through. The criminal theme runs rampant throughout Persona 5. 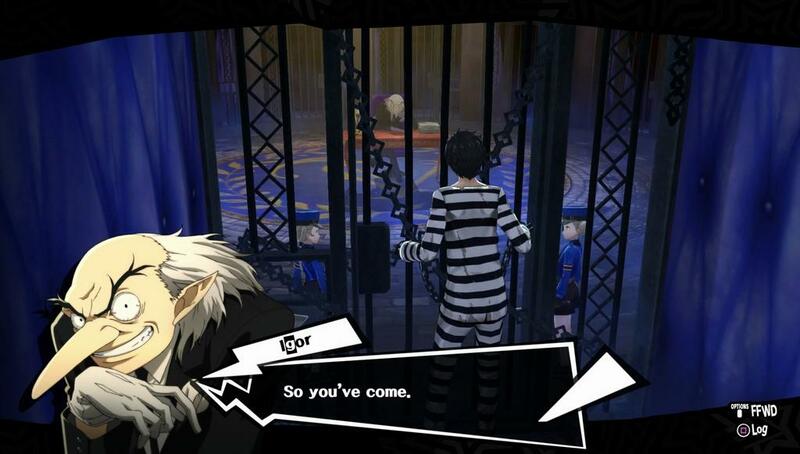 I wake in the Velvet Room wearing prison stripes, I’ve got wardens assisting Igor in an effort to ‘rehabilitate’ me. 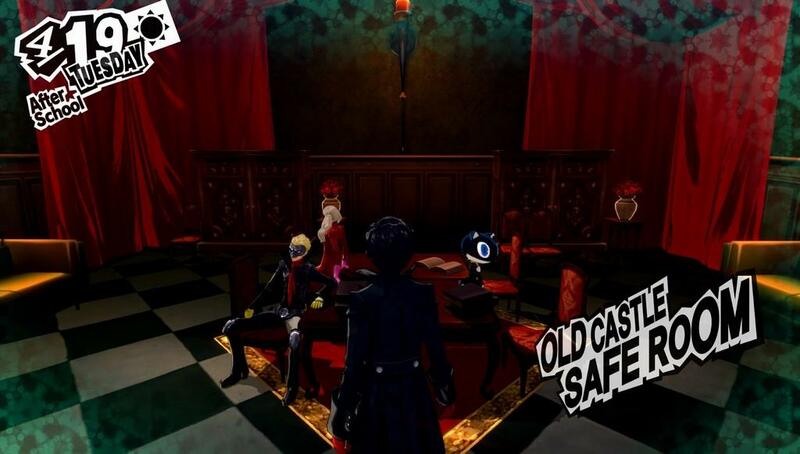 I’ve taken up the mantle of Phantom Thief, modeled after Maurice Leblanc’s, Arsene Lupin, and I’ve recruited others to join me in my fight against authority who have all felt the sting of injustice. There’s a few underlying themes beyond that, some of which seem to be social commentary on some aspects of Japanese culture, and worldly events at large. Don’t rock the boat, don’t make trouble for your family or school, keep your head down, politicians know best. This game feels rather timely and oddly appropriate in 2017, given our current socio-political climate. 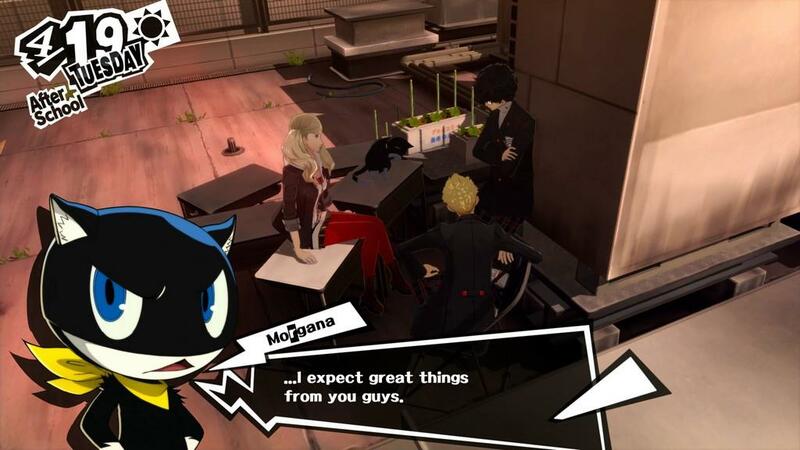 I really enjoyed the characters and their interactions throughout the story, from Makoto’s goofy spying on me, to Futaba’s growth from a recluse to a strong individual. Even Sojiro, the main character’s ward (where are his parents?) wound up being a loveable character. Then there’s Yusuke who’s the most aloof character I’ve ever seen in an RPG, his character growth curve seems the smallest of all, but he’s got great personality and makes a great straight-man when some of the comedy kicks in. 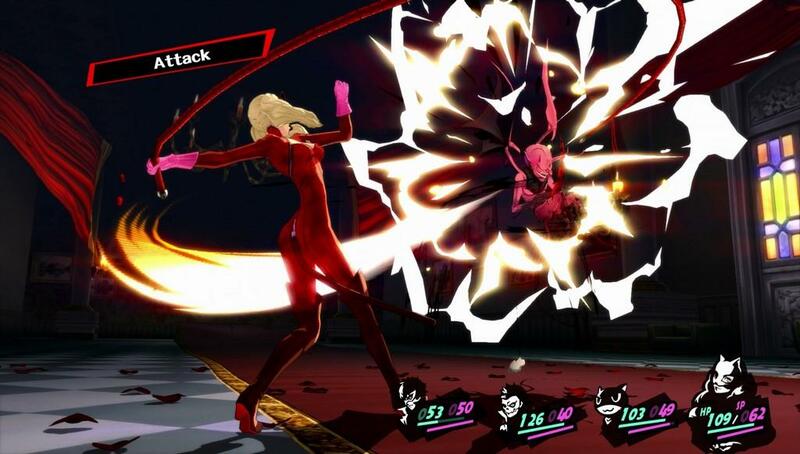 For the most part the characters are well written, and given how late this review is, I’ve had time to marinate on the ‘translation’ of Persona 5. There are a number of issues I have with the translation, but one of the least is the actual text. A lot of the lines I’ve seen highlighted have been without context, and having seen them in the game in action, they make a lot more sense. I think this game is a victim of having too many cooks in the kitchen, with six different translators and editors working on the game, there’s going to be some misinterpretation and questionable edits. But my biggest issue lies in how one of the main party members, Ann, is written. During the course of the main story, she’s a strong character who’s incredibly charming. But then when I was interacting with her for the confidant portions of the game she seemed air-headed, ditzy, a bit whiny, and it seemed like a completely polar opposite character that I had previously enjoyed. Another problem I had, playing this game with the Japanese vocal track, was the lack of subtitles for a lot of the in-game audio, especially during the newscasts in cutscenes. The game had already been delayed nearly two months, but a re-render of these videos with backed in subtitles was too hard to pull off? It’s cut corners like these that brought the whole production down. Another problem I had with the game is the really wonky camera system. 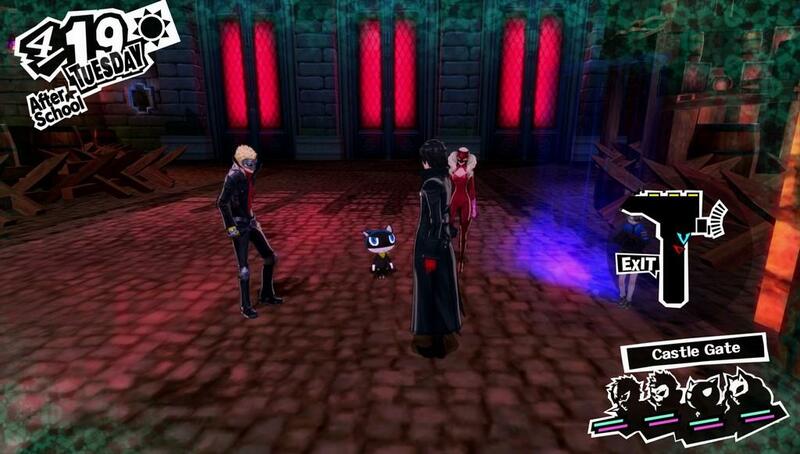 As a Phantom Thief you’re able to sneak by enemies by hiding in the shadows. When you engage in one of these hiding spots the camera locks into place and has a much more limited range. This is incredibly annoying to deal with when you’re not hiding behind a wall or at a corner as it obscures your vision more than it helps you to see enemies you can ambush. But I actually love the concept behind hiding in the shadows to hide to ambush enemies. It takes away some of the guesswork that previously went into fighting with enemies to get the initial attack. 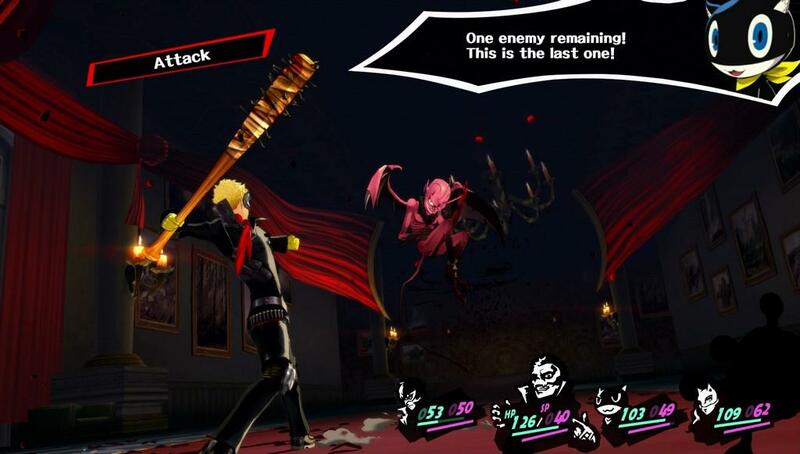 The strategy around getting that first strike is one of the key components of battle in the Persona games, so anything that makes that aspect easier, I am all for. 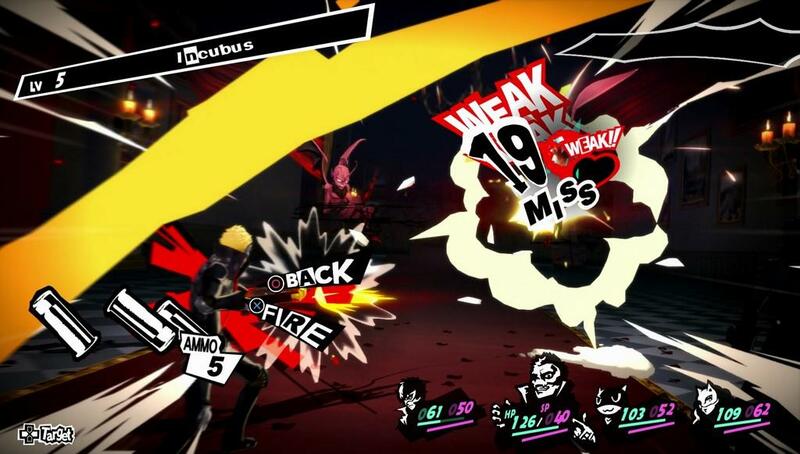 Combat remains largely unchanged from previous Persona games but features some welcome additions. 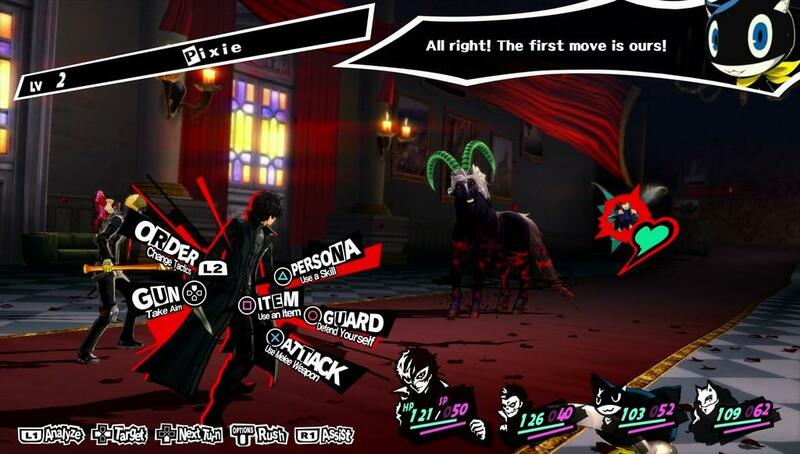 It’s turn-based combat where exploiting enemy weaknesses results in extra actions, and this goes both ways, so being keenly aware of strengths and weaknesses of each Persona is important. The biggest shake-up is the addition of demon conversation and guns, which are regular features of the Shin Megami Tensei games. Damage an enemy enough, or knock down the entire enemy party and they can be held up or they’ll beg for a conversation which can yield cash, items, or result in the Persona switching sides. 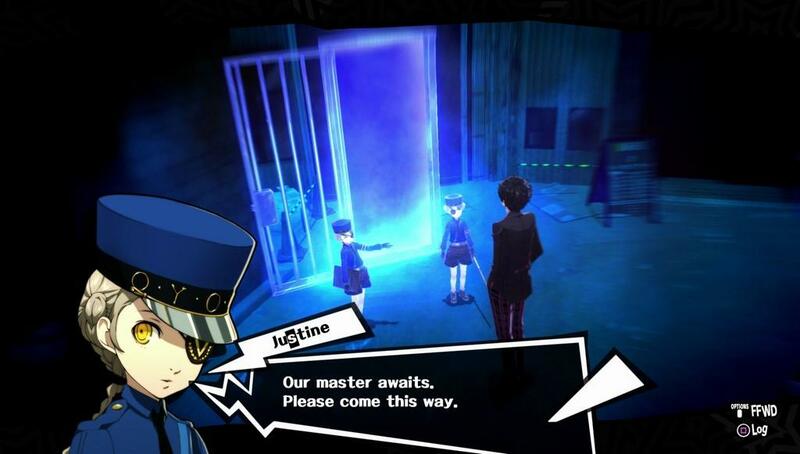 Take those Persona to the Velvet Room and fuse them with other Persona to create even more powerful creatures to take into battle. The inclusion of guns, nuclear, psychic, bless, and curse damage really help flesh out some of the combat and makes some old skills more useful. Catch an enemy with an attack that causes confusion? Use a psychic skill to do extra damage, or nuclear when an enemy has been shocked or frozen. 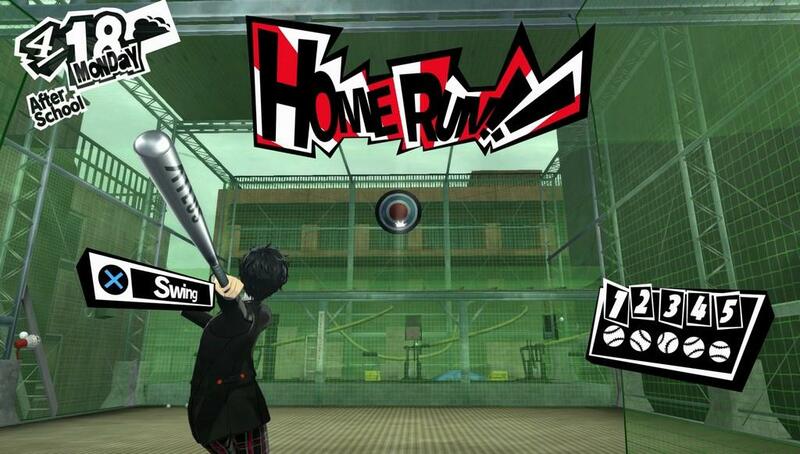 The combat is just as challenging as previous Persona games, where no victory is guaranteed. A conversation can go awry, an enemy could dodge an attack they would normally be weak against, and in an instant your fortunes change. Combat also feels a lot quicker this time around, with less wait time between spells and actions, everything feels tight and snappy and responsive, which is a weird positive to have, but when you’re in a turn-based system, the faster it moves, the better. 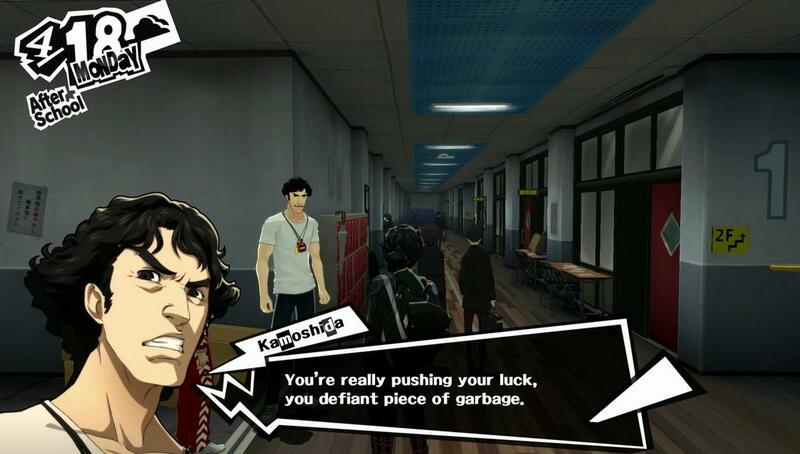 If you haven’t played previous games, the core loop involves going through a daily life at school, and then after class it’s off to studying for classes, strengthening your bonds with your confidants, or getting out of the latest pickle that Ryuji managed to get the team sucked into. I’m only partially joking there, but he sure likes to be an antagonist in disguise with the way he rails against establishment types.In order to escape your fate, you’ll need to change the hearts of whoever’s holding your future hostage, whether it’s the teacher that wants you expelled, or the thug who’s got compromising pictures of you, you’re going to have to invade their palace in the ‘Metaverse’ and steal back your future. Or you can change the hearts of specific individuals via the quest system, which brings you to the randomly generated ‘Mementos’ dungeon. I really dig the structured dungeons this time around, with all the main dungeons being more about the set pieces than just random hallways. Visually, Persona 5 is hands down the most visually rich game released this generation. I say this against technical marvels like Horizon: Zero Dawn, and Final Fantasy XV, Persona defeats them just with the pure style that this game oozes. The character models are impressive, but the set pieces are the real stars of the show. Each one is visually distinct and has at least one memorable point where I had to stop and just say, ‘wow.’ There are some spots where it looks like concessions had to be made for this game to get back-ported to the PS3 (or since that’s where they started, they could only improves the graphics in a limited scope in order to retain parity with the PS4 version), and you’ll see it in the NPC character models. On the audio front the game is fantastic, Shoji Meguro may have created the track of the year with ‘Last Surprise,’ the combat theme that is infectious the first time you hear it, and sticks with you long after your adventure reaches its inevitable conclusion. The rest of the soundtrack is excellent, with this cool 70’s cop drama disco vibe, though I felt like final boss music was a beat weaker than previous games. I think the bar was set unreasonably high with Persona 3’s ‘Battle Hymn of the Soul.’ The English voice cast is also rather good, and while the option for a Japanese voice track is there, it’s missing what feels like key subtitling work in certain situations, so I almost recommend playing exclusively in English. Persona 5 is easily in the running for my game of the year and we’re barely halfway into the year. Atlus has done a phenomenal job here and from start to finish this game is excellent. The things I complain about are minor, and are annoying, but ultimately don’t detract too much from what is one of Atlus’ best efforts to date. We’ve all been waiting a long time for this one, and I’m happy to say that the wait has been more than worth it. Now to dive into New Game Plus. I'm glad to say that Persona 5 is everything I had hoped it would be and then some. The incremental improvements over the gameplay of Persona 4, the visuals, the soundtrack, all of it came together almost perfectly. That translation could have used a little bit more polish, but otherwise this is the finest work Atlus has ever produced.